How to automate code generation for each form sent? I need to generate a huge list (of hundreds of names) through an on-line registration form (I already setup dotform) yet I have to generate a code for each person that suscribe to my event and I have to send the code to them. I know there must be a way of doing it automatically as people register and send in there applications. Is there a way to do this via jotform? Is there an advanced application that instead of sending out a "thanks for registering" message, to send a personalized code to identify themselves on the day of the event? It is possible to add an Unique ID / Random Value Generator widget to the form. 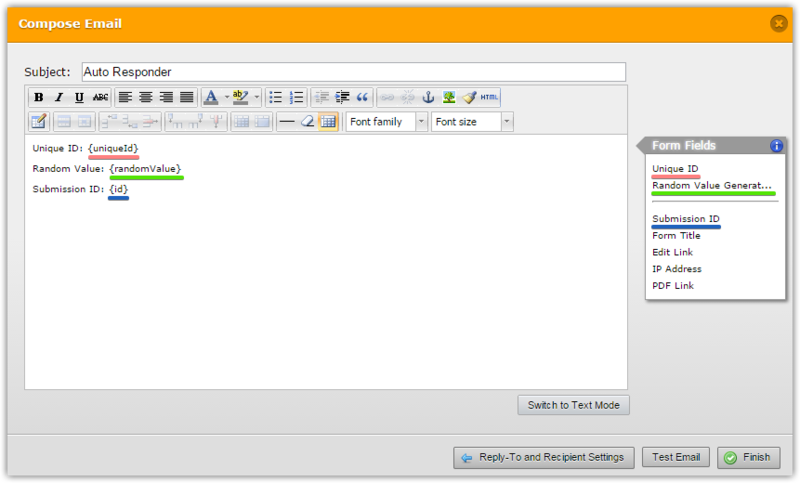 Then, provide the form user with the generate value in Autoresponder email. Also, each form submission has its unique Submission ID, so it can be used too.